Our garden is based in Shelley Gardens, off City Road. 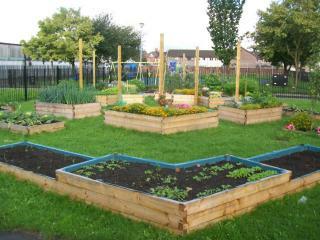 It is a garden for all members of the community to enjoy and get involved with. these times to come in and help, or simply sit and enjoy the garden and a chat. If it is raining and the garden is locked up, we might be having a cuppa in AJ’s cafe on City Road! Members of the garden group will also be able to access the garden at other times during the week by signing out a key from Plasnewydd Community Centre during its normal opening hours. Membership is now open! Becoming a member isn’t a big commitment and you are not expected to be in the garden all the time! We just ask for a £5 membership fee per adult for the year and your contact details so we are able to keep track of who has access to the keys. Please note that children must be accompanied by a responsible adult at all times, if they are to enter the garden. We would really love you to come along and enjoy the garden with us. For more information email : roathresidents@gmail.com, find us on facebook (Plasnewydd Garden) or twitter (@PlasnewyddCG), call us on 07831 196851, or drop in a note to Plasnewydd Community Centre! This project is run by Roath Residents’ Action Group, and funded by Tidy Towns.